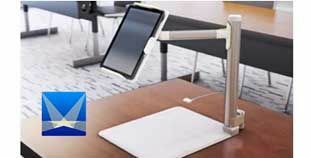 Price: $4.99 – before the VPP discount available for qualified educational purchases through Apple’s Volume Purchase Program.Belkin’s Stage App combines the convenience of a document camera with the power of an interactive whiteboard. It enables educators to sketch and annotate over live video, and displays objects using the iPad camera with the ability to sketch, write, label, or laser point to objects in real time. The Belkin’s Stage App allows students to be more engaged with the instruction because they can use iPads to demonstrate their work. They liked that they could write on the tablet and see it projected on the screen. The app is very easy to use and set up. There was very little need for support in using program. The app was very easy to use. There are many different uses for the program. Teachers can use it for quick math and science demonstrations of either problems or diagrams. They can easily incorporate the microphone to allow students to explain their work for classroom presentations. Coaches could also use this app to demonstrate plays or actions on the field or court. The Stage Pro is a simple and affordable replacement for interactive whiteboards and document cameras. Students and teachers can easily integrate the program in their classrooms and find enthusiastic engagement. This is a great product that will allow students and teachers to become engaged and excited by their lessons in ways that are more fun than just writing on a worksheet. The app can be used for many types of classes and school activities. Cost effective (replaces the need for expensive interactive whiteboards or additional document cameras).